It took me 15 years to decide to upgrade from Windows XP, and I only made the decision because I was forced by Microsoft to buy the latest operating system, or allow my computer to be infected with thousands of parasitic viruses that would probably eat away at every microscopic section of my motherboard and all my other hardware which would then force me to have to buy a new computer. I decided I was due for a new operating system anyway, so I figured what the hell, I’ll buy Windows 8.1 full install. I didn’t buy the upgrade because I didn’t want to have to install Windows XP then upgrade to 8.1 every time I reformatted or had to buy a new hard drive. I figure if I’m going to install an operating system, I’d rather install the one I’m going to use immediately and for a long time instead of having to go through 2 installations, which could take an hour each. The start window for 8.1 looks awesome to me. Everyone said I would hate it, because they assumed I refused to upgrade because I hated the 8.1 start window, but that simply isn’t true. I’m cheap as hell. No seriously, I’m living on a low income disabled budget, which has absolutely no budget for a new $100 operating system. It just so happened that I had a bulk sale for tassels, and that was what helped me buy Windows. See, that’s why I have a Etsy shop. If I need to buy something, I can count on people to buy keychains or earrings if I beg them to lol. My sales are usually nothing every month, so those occasional sales are awesome. 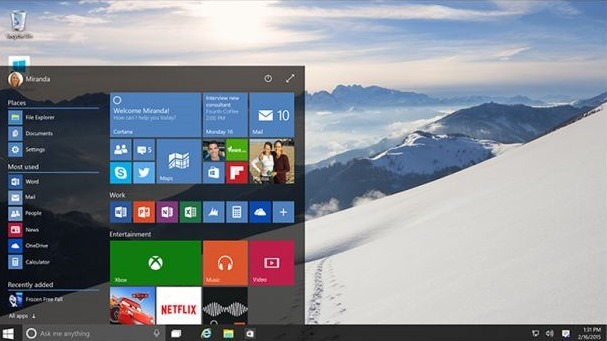 The Start window for Windows 10 looks a lot smaller, to say the least lol. I quite enjoy the 8.1 Start window because when I’m watching TV, it is a dark enough screen that it doesn’t bother me when I’m watching my shows. If the screen is bright from Facebook or if I have a bright desktop image, then it hurts my eyes to look at the TV and have the bright computer screen in the corner of my eye. I hope they have given us an option to choose this smaller window, or a full screen start window. If the image above is our only option, well, then I guess I’ll have to just deal with it. As with all new operating systems you want to give it a few months before installing just because you may have to live without your printer or your webcam or any other external hardware you might have if they were sitting on their thumbs when they should’ve been making new drivers. There is also a chance that your favorite MMORPG isn’t compatible. You might have to miss raiding for quite a while. Of course I would find out if they have support for Windows 10 before installing it because they may have a version specifically for Windows 10 all ready to go. I love new things only because I get bored easily, but I’m quite content with what I have for now. I say I will wait to make sure everything works, but I’m sure there won’t be too many issues. I have a Microsoft webcam and a Kodak Printer, which I’m sure will be ready long before Windows 10 is downloaded. I’m sure my keyboard and mouse work since I trust Logitec will have it ready to go. I don’t usually have to worry since they are plug and play. So if you are one of those people who panic at the thought of something new, take a chill pill and give it time, but don’t miss out on reserving your FREE copy of Windows 10. They are giving you something for free, so take advantage of it while you can. You don’t have to install it immediately, I’m sure you can burn the installation files onto a cd or dvd and install it when you are ready. If you have panic attacks at the thought of issues, then just check to see how other people are dealing with them before you take the leap. I actually look forward to the new Windows 10 that I just may buy a bigger hard drive and start over from scratch so I have a FAST new experience. We will see in another 7 weeks.